Two Large Fires Raged On Scottsville's Main Street, February 1976. Comments: The photo of the intersection of Valley Street (left) and Main Street (right) shows the Esso Station, run by Gene Johnson, occupying the lot west of the Travelers Rest Hotel. The Omohundro Hardware Co. occupied the bottom floor of the Travelers Rest in 1976. On the night of 26 February 1976, a disastrous fire consumed this hotel and hardware company, burning them to the ground along with the adjoining filling station. Two nights later on 28 February 1976, a second fire began inside the rear of W.F. 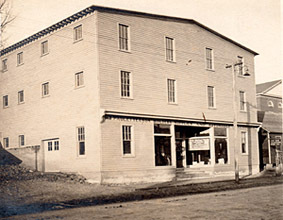 Paulett and Son, Inc., a building supply company located just east of the hotel on Main Street. This fire spread to the Scottsville Methodist Church next door to the building supply store and gutted it before the fire was brought under control. Arson inspectors from the Virginia State fire marshal's office probed the still-smoldering fires for nearly two weeks, but found few clues as to its cause. The Albemarle County Sheriff's office said their investigators "feel certain it was an arsonist." Scottsville residents, alarmed at the progression of blazes posted more than $3000 in reward money for the arrest and prosecution of the arsonist at large. To learn more about these two disastrous fires in Scottsville, please read the coverage given these 1976 fires in The Daily Progress, Charlottesville. SCOTTSVILLE -- The second large fire in a week raged through this town in the early morning while firemen from at least four counties and the City of Charlottesville worked to douse the blaze. An entire city block between South Main Street and Valley Street was in flames and dark clouds of smoke and flames were visible from at least seven miles distant. Scottsville Mayor Raymon Thacker described the blaze as "many times worse than" than a blaze which earlier this week destroyed adjacent buildings causing an estimated $200,000 damage. The fire originated at Paulette's Hardware Store about 10:45 p.m., according to the store owner, Haden Anderson. Standing across the street from the store, Anderson said he entered the building from the third floor and managed to retrieve a safe and some equipment before he was forced out by the flames. Arson inspectors from the state fire marshal's office have been probing the still-smoldering rubble from the latest blaze for nearly two weeks. Scottsville residents, alarmed at the progression of blazes have posted more that $3000 in reward money for the arrest and prosecution of the arsonist at large. The blaze brought firefighters from Fluvanna, Nelson, Buckingham, and Albemarle Counties as well as from the City of Charlottesville. There were no injuries reported as of press time. Aside from the hardware store, which was totally destroyed, the fire engulfed the Scottsville Methodist Church, a building which was saved in Thursday's fire. Other buildings in the block were totally destroyed. "This is just as bad as when the Yankees went through here," said a Scottsville firefighter. One observer said the fire was five times larger than the one Thursday morning. Firefighters threw water on all of the surrounding buildings, and frame houses directly across from the blaze were smoldering. The firefighters were desperately attempting to save the Scottsville Museum and the Barclay House across from the fire. At press time, telephone communications were out for downtown Scottsville. Observers said the blaze appeared to be brought under control as of 1:30 a.m. today. Soon after the blaze began, an unidentified Charlottesville fireman, when asked about the fire in Scottsville, said, "We're sending everything we possibly can send. Our engine called from five miles out of town, and they said they could see the fire." Fire companies from Crozet, North Garden, Stony Point, Charlottesville and East Rivanna responded to the fire. A Charlottesville fire department spokesman said the firefighters were probably having trouble with the town's fire hydrant system. In Thursday's fire, only three of Scottsville's 22 fire hydrants were workable. The lack of working fire hydrants were blamed for the destruction of the hotel, which was to be razed to make way for a downtown mall. Albemarle Fire Marshall Kelly P. Reynolds said Friday it would cost $100,000 to replace the city's 22 hydrant system, which is nearly a century old. "I can tell you it's a crying shame," said Scottsville Fire Chief Grover Mowbry. "This town's been taken twice by floods and twice by fire." Mowbry said damages would "easily run into the millions of dollars, but no injuries had been reported at this time," he said. Mowbry declined to comment on the possibility of arson. But added, "I won't rule it out at this time." He said the fire is being investigated. The chief said his crews are faced with the identical problem which hampered firemen in Thursday's fire, but tonight "we knew what to do. We went straight to the river." Estimating 300 firemen and 75-100 pumpers from as many as 25 departments battled the blaze, the chief expressed appreciation for the aid and response from adjoining counties. SCOTTSVILLE -- Arson was considered the probable cause of two fires, one Thursday and one Saturday, which leveled an entire block along Scottsville's historic Main Street causing between $750,000 and $1.5 million in damages. Although investigators Saturday would not say they definitely have determined the fires were arson, Albemarle County Fire Marshall Kelly P. Reynolds said, "It's too damn coincidental. The fires both began late at night and in the rear of the buildings." State Arson Investigators and Albemarle County Sheriff's deputies set up a command post in the Scottsville Elementary School where they spent the day questioning witnesses and suspects. Albemarle County Sheriff George W. Bailey early Saturday said his investigators "have some suspects." He said his deputies "feel certain it was an arsonist." Late Saturday afternoon, the Sheriff's chief deputy, James L. Higgins, said, "We have eliminated the suspects for now. We don't have any concrete suspects, and not a whole lot to go on." He said investigators have searched through the rubble and did not find any firm evidence of arson. But he pointed out the fire was so intense, it probably would have eradicated any evidence. Bailey said investigators will make a detailed study of the fire scene beginning Monday. He said they will sift through every bit of the rubble in search of clues. "There's no doubt in my mind that it was arson," he said. Contacted late Saturday evening, Bailey said his investigators have firmed-up some leads. "We have suspects." He declined to elaborate." State Arson investigator James H. Jessup, who is heading the probe, was more cautious than the sheriff. He would only say, "It's a suspicious fire, and it's being investigated. We know where it started but not how." The arson investigator said the second fire began about 11 p.m., Friday, inside the rear section of the W.F. 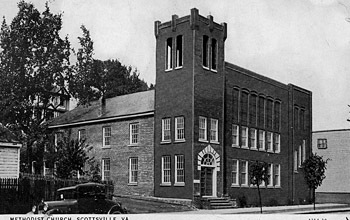 Paulett and Son building supply company, the largest business in the town of 300, and spread to the Scottsville Methodist Church before it was brought under control. Both the Thursday and Saturday fires began in the rear portions of the buildings, Jessup said. Jessup refused to say if investigators had any leads to suggest arson. However, other officials said witnesses saw a few juveniles behind Paulett's shortly before the fire broke out. Scottsville Mayor Raymon Thacker said he was conservatively estimating damage at $500,000 to the building supply firm, and at $225,000 for the church. Rev. H. Fred Edge said he cannot place a dollar figure on the church. It was erected in 1933 and "it was priceless," he said. Mrs. Samuel L. Spencer, one of the three owners of Paulett's said the owners would have no estimate of the damage until at least Monday. But Scottsville Volunteer Fire Department Chief, Grover H. Mowbray, estimated damage to the store at between $1 million and $1.2 million. Damage in the Thursday fire, which leveled an unused hotel, a service station, and a small warehouse, was estimated at between $100,000 and $200,000. There were no serious injuries in either fire. Firefighters were hampered in battling both blazes by a lack of water pressure in the town's fire hydrant system. There were only enough water pressure to operate about three of the town's 22 hydrants. In order to battle both blazes, water had to be pumped in a quarter of a mile from the James River. "If it hadn't been for the James," said the Mayor, "this town wouldn't be here." It's ironic, he pointed out, since James River floods in 1969 and 1972 nearly destroyed the town. "You know," said an exhausted Mowbray, "the river washed us out two times, and now it's saved us twice---I guess it's pretty even." Although the second fire was brought under control about 2 a.m. Saturday after being battled by about 300 firefighters from nearly every fire department within 30 miles of the town. Firefighters continued pouring water on the smoldering ruins late Saturday afternoon. Smoke from the smoldering rubble hung over the river valley near the town throughout the day, and occasionally flames flared-up as embers were fanned by a light breeze. A curfew was imposed on the town about 2:30 a.m. Saturday in order to clear spectators from the fire scene, but by early morning the town was clogged by area residents out to see the damage. "People should have been home, but some people are really excited. Some think there's someone sick out there, and many people are worrying who he's going to hit next," said Mowbray. To help prevent any recurrence, extra sheriff's deputies were assigned to patrol the town Saturday. Telephone and electric company work crews spent much of the day restoring service to the town for the second time in two days. Both the Thursday and Saturday fires cut electric and telephone service to the downtown area. Thacker said he was watching television in his home when the fire broke out late Friday night. His home is located directly across Main Street from the Methodist church. "I heard sirens and ran to the window to look out, and all I could think was oh my God, not again! The horror of it was so vivid I just didn't think anything other than my God, we've got to get it out." Mowbray said his small force initially concentrated on keeping the fire from getting to nearby homes and to the Scottsville Museum, which houses the town's historic treasures. The fire chief said he has nothing but praise for the response provided by area firefighters. "Without them, the town would have gone up." While Mowbray and his firefighters battled to keep the flames from engulfing the museum, Robert J. Walls, the curator, and a band of 35-40 volunteers rushed into the museum and carried out nearly everything, including original manuscripts. State arson investigators and Albemarle County Sheriff's Department detectives today began sifting through charred ruins in Scottsville searching for a clue to two fires which last week leveled an entire block of the town's historic downtown district. Investigators today remained convinced that the two fires -- one early Thursday morning which destroyed three buildings and one which began late Friday night and raged through early Saturday morning leveling a building supply store and a church--were the work of a torch. However, they had no hard evidence on the fires which caused up to $1.5 million in damages. "I'm absolutely certain it was arson," said Albemarle Sheriff George W. Bailey. The sheriff's deputies and state arson investigators were concentrating their efforts on reports that several juveniles were seen in an alley behind the W.F. Paulett and Son building supply company when the second fire began late Friday night. The sheriff said his deputies and arson investigators have questioned several witnesses and possible suspects. "We now have two suspects in in mind." He said investigators would be conducting additional interviews today. Bailey said he considered it "possible" arrests might be made today. The sheriff declined to provide any other information about possible suspects. However, investigators Sunday said they had no concrete evidence. At one point Saturday morning, investigators thought they had stumbled upon a major clue. A gasoline can was found near a telephone pole only 10 yards from the spot where the Paulett fire erupted. The can turned out to belong to one of the fire companies which battled the blaze. The can contained gas used to fuel some of the firefighting equipment, said Capt. James L. Higgins, the chief investigating officer of the Albemarle County Sheriff's office. While exhausted investigators used Sunday as a day of rest, residents of Scottsville began picking up the pieces. The Rev. H. Fred Edge, whose 150-year-old United Methodist Church was gutted in the second fire, held Sunday services in Scottsville's Episcopal Church. More than 80-members of Edge's congregation crowded into the tiny Episcopal church which sits on a hill overlooking the still smoldering ruins of their church. More than 80-members of Edge's congregation crowded into the tiny Episcopal church which sits on a hill overlooking the still smoldering ruins of their church. They heard Reverend Edge tell them a few of the church's treasures had been salvaged, the altar cross, two stained glass windows, the altar rail, some hymnals, and a few pews. "Look on the bright side," the minister told his congregation, "no one was seriously injured." Ironically the church's Sunday offertory was to have gone for Guatemala earthquake relief efforts. For Wilson L. Dansey, one of the three owners of W.F. Paulett and Son, there is not much of a bright side. His company, once the biggest business in the town of 300, was totally destroyed. Pointing to the hill on which the store was located, he said, "We've got a hillside down there now, that's all." The three owners have set up a temporary office in a dilapidated brick house on Jackson Street, within 50 yards of the remains of the old store. The owners have declined to guess at what their loss was, and said they hope to have a fire estimate today. Scottsville officials, however, have guessed the company's loss at anywhere from $500,000 to $1.2 million. The Methodist church received an estimated $225,000 damage. In the Thursday fire, which destroyed a service station, an old hotel, and a small warehouse, damage was estimated at more than $200,000. The small town was clogged Sunday and early today with motorists driving by, rubber-necking at the damage. Members of the Scottsville Volunteer Fire Department took advantage of the heavier than normal traffic by standing at intersections collecting money for the squad. The small, 60-member volunteer department was assisted in battling both blazes by firefighters from nearly every department within 25 miles of Scottsville. Residents of the normally tranquil James River town have expressed fear their shops or homes might be next. Perhaps summing up the general feeling, Scottsville Volunteer Fire Chief Grover H. Mowbray said, "I don't know why anybody would want to destroy a town like this. We've got a sick person who needs help." Rumors have been widespread in the aftermath of the two mysterious fires. The most frequently heard seem to center on speculation a firebug is bent on wiping out the town. According to one rumor circulating Sunday, a downtown merchant had found a "You are next" note taped to the front of his business. Authorities say they have no evidence to substantiate that rumor. Another rumor mentions the historic Canal Warehouse, built along the James River as part of a canal system used in the 1800's as a possible target of arson's torch. A deficient fire hydrant system in Scottsville has not been repaired because of the cost, according to Albemarle County Fire Marshal Kelly P. Reynolds. The century-old system is so antiquated it probably would have to be replaced, and consequently nothing has been done because it will "cost a lot of money. It's just a matter of cost and who will pay for it," Reynolds said today. Reynolds estimated the price tag for replacing the town's 22-hydrant system would be at least $100,000. 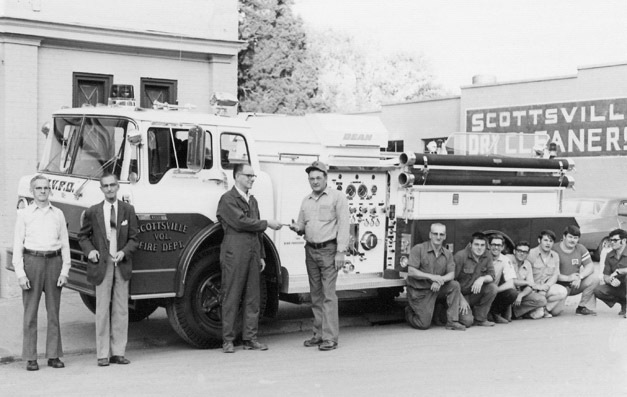 The fire marshal said in June 1975 he issued a report warning the Albemarle County Board of Supervisors "the fire hydrant system in Scottsville is unacceptable for fire protection purposes. The flaws in the system became vividly apparent early Thursday morning when a fire broke out in an old hotel located in the town's historic downtown district. The fire raged out of control and at one point threatened to engulf the entire downtown area before being brought under control. The blaze leveled three buildings, and Scottsville officials contended the loss was totally unnecessary. Scottsville volunteer fire chief Grover H. Mowbry said only one fire hydrant near the hotel worked. He said he was certain the fire would have been extinguished without much trouble had the town's fire hydrants been operating. The fire chief said only three of the community's 22 fire hydrants were operating. Reynolds said many of the town's hydrants are mechanically inoperative. But even if they were ok, the system does not have a sufficient amount of water of sufficient water pressure. If three or four of the hydrants are turned on at the same time, all firefighters will get is "a trickle." The fire marshal said that during the past year, the county service authority has fixed all inoperative hydrants in the county except those in Scottsville. "It's just been kept on the back burner." Reynolds said he will be meeting Wednesday with the Board of Supervisors to discuss the problem. He said he plans to recommend the board hire a consulting firm to study the situation and recommend what should be done. Albemarle Board Chairman Gerald E. Fisher said on Thursday the board would meet with Scottsville officials next week to discuss the hydrant situation. Fisher said he expected the discussion would include questions about what parts of the system should be given high priority for repair and who has responsibility for funding repairs. The hydrant system was taken over from Scottsville several years ago by the Albemarle County Service Authority. E.E. Thompson, authority executive director, said Thursday that he was aware of only five plugs in the system that did not work at all. Thompson said the town "still has protection but it may not have been the best." The authority director said he did not believe the town was endangered because of the faulty system. But he said, "The lines are really old and are not in the best condition." The service authority director said repairs to the system had not been made because equipment needed to make repairs had been ordered last year but not received by the authority until last December. Because the repair process involves "tapping" into the system to install values using hot lead poured joints, the service authority has to wait for warm weather. "We were getting in position to repair the lines," Thompson said. With the recent warm weather, he said, the authority was making plans to attempt to repair the system within the next two weeks. The three buildings were owned by George T. Omohundro, and he rented the service station and adjacent warehouse to Martin R. Turner. Omohundro estimated the three buildings were worth $175,000. He has insurance to cover $75,000 worth of damage. Turner told The Daily Progress this morning that he had figured his losses at about $30,000 for equipment and merchandise at the service station. He said that he did not have insurance. Initially reports on the morning of the fire indicated that the hotel was scheduled to be razed to make way for a mall as part of a revitalization and flood protection project for the town, However, Omohundro today said plans for tearing down the hotel were in "the wishful thinking stage" at this point. The 21-room hotel had not been used as a hotel for more than 15 years, Omohundro said. He had converted part of the building into apartments, he said, but only two were being rented--one as an apartment and the other as a business office for a church. The above photos are part of the Robert Goldstone, Robert Ash, and Raymon Thacker collections at Scottsville Museum.